Before we had children, one of our very favorite things to do was go to the theatre. Each year we would get season tickets to either the Seattle Rep or the Intiman and see incredibly high quality shows. One year, we did a special deal where, in addition to the tickets, we got a fixed price dinner (with a deep discount) and a restaurant right nearby. The place is nice inside and the food was fine and we always enjoyed our evening. This year, after only seeing a show here and there for the past four years, we got season tickets to the Rep. We will see eight plays over the course of their season. We have already been to two and I have to say it is so nice to have this part of my life back. The other night, Randy and I went to see Edward Albee’s Three Tall Women and, for old time’s sake, decided to eat at that old restaurant. It’s still a sweet place but the menu is almost exactly the same as when we last dined there, about four years ago. That is never a good sign. Worse, my food – which was always passable before – was pretty terrible. My salad was soggy and there is not much I like less than soggy salad. My main course, a wild mushroom risotto, was nearly inedible. It was barely warm, chalky and mushy, with bits of undercooked sweet potato (huh?) scattered throughout and bits of brown that I could only guess were mushrooms. As a nod to the “wild” part of wild mushroom risotto, there were a couple of chanterelles charred almost beyond recognition sitting atop the mush as a garnish, along with a giant sprig of tarragon (again, huh?). Eating such a terrible dish made me want to give mushrooms a better experience. Allow them to shine all their glory instead of hiding them throughout overcooked rice. When I was planning to make the fregola the other night, I had a sense that it was going to be on the lighter side. I felt like our dinner could use a more substantial side than just the green beans I had in my refrigerator. This flavor packed side dish stars some Asian ingredients but it really would go with just about anything. It’s the kind of thing that you keep picking up pieces to taste, long after you have decided that the seasoning is spot on. I used cremini, shiitake, and chanterelle mushrooms, but any would be good here. 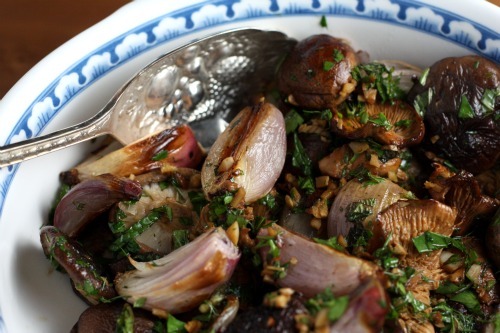 If you are going to roast whole shallots, as the recipe instructs you to do, I would use very small ones. If yours are large, I would slice them into rounds and roast them that way instead of cutting then into quarters like I did. Preheat the oven to 400ºF. In a small bowl, combine 2 tablespoons of the sesame oil with the garlic, ginger, and soy sauce. Spread the mushrooms on a baking sheet and drizzle with the sesame oil mixture; toss to coat. Season with salt. (DT: be very careful with the salt since soy sauce is so salty.) Roast the mushrooms for about 30 minutes, until tender and glazed. Meanwhile, on a second rimmed baking sheet, drizzle the shallots with the remaining ½ tablespoon of sesame oil; toss to coat. Season with salt and roast for about 25 minutes, turning once, until golden brown and tender. 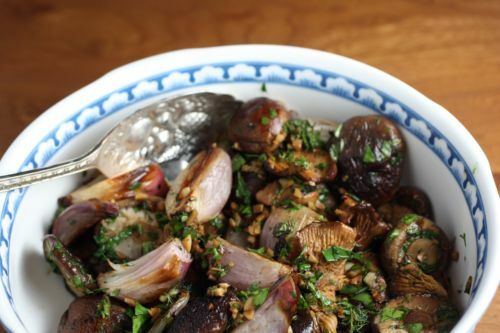 Place the mushrooms and shallots together in a bowl and add all the herbs. Toss well to coat the vegetables with the herbs. Serve warm. I have never roasted mushrooms! What is wrong with me? I can’t wait to try this dish! god i bet this smelled insanely crazy while cooking. i love the smell of shallots simmering away. I’m sorry you had such a horrible dining experience. Your mushroom dish looks like perfection. My husband loves mushrooms, so this is a must try! Then again, if a poor dish inspired you to make this beauty, I’d say it was well worth the initial disappointment. This looks great! I adore mushroom risotto – I’d be pissed to be served a really bad one. Ha. It is such a disappointment though – those kinds of situations. I’m glad you gave the mushroom the treatment it deserves! There is nothing worse than eating a seriously disappointing meal when you’ve been looking forward to it. But you’ve more than made up for it with these shrooms! This looks so delicious and filling. 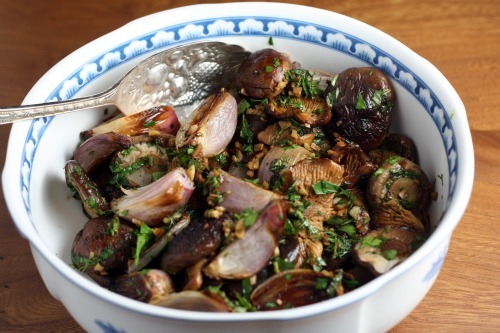 I’ve never made an asian inspired mushroom dish and I can’t wait to try this. Thank you for your recipes! I discovered your “treats” thanks to Willi Gallagher and have so enjoyed reading – inspiring to have vegan and vegetarian recipes – not having to edit out the meat bits. We made frites the other night and so enjoyed! I love roasted mushrooms! They look delicious paired with fresh herbs and roasted shallots.